Baldwin Boats’ staff comprises fully-qualified and factory-trained Mercury, MerCruiser, Malibu, Indmar, PCM and Kawasaki technicians. 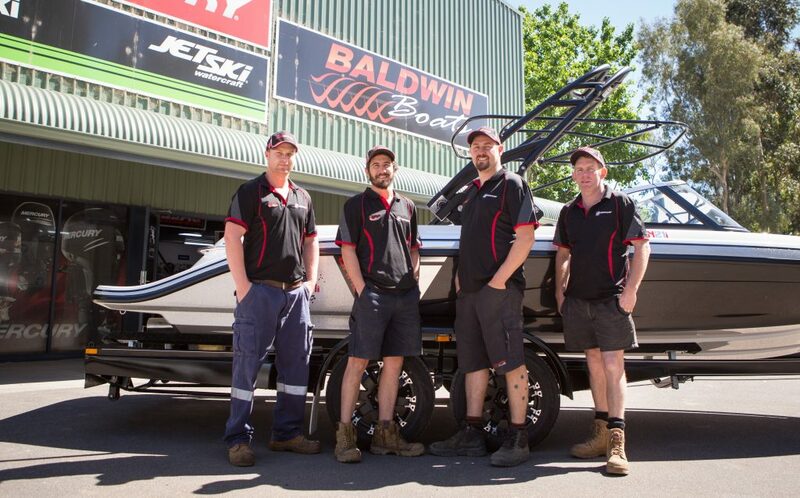 Baldwin Boats is also the first Mercury Premium dealer in Victoria. • Servicing and repairs to all makes of marine engines, Inboards, Outboards and Kawasaki Jet skis. • 50 point safety checks. • As we’re right on the river, we test drive all new and serviced boats. • All boats up to 7m are cleaned after service or repairs. • Eco-friendly wash bay using rain water. • Boat maintenance, alterations, repairs and cut and polishing. • 24-hour on-call service for emergencies. • Customised vinyl cut registration numbers or name for your boat. • Insurance/valuation reports on all vessels including houseboats. • Our construction and service facility is all indoors and security protected. • Demo any boat on the Murray River at our own ramp located only metres from the water! “Well, we have just spent our first day and night on the “new” boat, and I am pleased to say it all went very well. This morning I got up and checked the oil in the engine, after about 6 hours cruising yesterday, and noticed that every little joint and linkage had been carefully greased and lubricated – just as it would be by someone who took pride in their work.